iOS users interested in jailbreaking their devices will likely appreciate knowing that a new jailbreak is available for iPhone, iPad, and iPod touch models that are running iOS 11.3.1, iOS 11.3, iOS 11.2, and iOS 11.2.x builds. 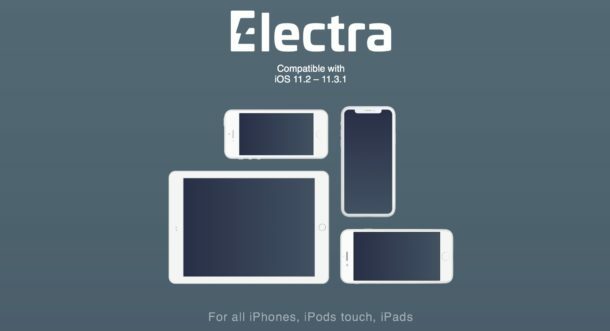 The new jailbreak, called “Electra”, has several requirements to be able to perform the successful modification of iOS system software. For the less familiar, jailbreaking uses an exploit to gain root access to an iOS device thereby allowing users to modify the core software on the iPhone or iPad. Often this is for the purpose of installing appearance themes and visual tweaks, or for installing software to the device for various reasons. Jailbreaking is generally considered advanced and is best reserved for advanced users who like to tinker with their devices and who understand the full risks associated with the process, including potential data loss and security threats. Apple is strongly opposed to jailbreaking, and there are many reasons not to jailbreak an iPhone or iPad. We do not recommend it either, except for the truly advanced users who have prior jailbreaking experience. Using and completing the Electra Jailbreak is a multistep process that is far beyond the scope of most iPhone and iPad users, which should emphasize that it’s really only appropriate for more advanced individuals with prior jailbreaking knowledge. Always complete a full backup of an iPhone or iPad before installing any system software, or before attempting to modify any system software. The availability of the Electra Jailbreak is mentioned mostly for informational purposes and we certainly do not recommend jailbreaking any iOS device. Apple may choose to deny warranty service to jailbroken devices, among the various other reasons not to jailbreak an iPhone or iPad. I don’t see a reason to jailbreak anymore, there is just no benefit at this point. I appreciate the technical aptitude of those who create these tech hacks though and I think it is an interesting topic, even if I no longer have direct interest in it. As for Electra1131, I have investigated the Electra jailbreak a bit too and it seems there are many problems and unsuccessful attempts at using it. This is for the most advanced users possible with exceedingly large amounts of patience. Lots of failed attempts of using it. Lots of incomplete attempts. Lots of error messages. And it sounds like some people are “bricking” their devices trying to run it without the proper know-how. Not worth it! I want my iPhone to be secure and stable. Jailbreaking makes it insecure, and less stable. Thanks, but no thanks. Plenty of reasons. Its OK if some disagree. OSXDaily, regardless of opinion, thanks for reporting the news. I am tired of jailbreaking my device. But it’s not about jailbreaking get so weird but the jailbreaking process made everything so messed up. I have been trying to jailbreak my iOS 11.3.1 by electra with cydia impactor and i faced so many errors. but i tried Silzee online jailbreak and it helped me to get rid of all the cydia impactor errors. i think choosing the right kind of tool for jailbreaking is the solution. Im pretty sure that you already have jailbroken your device!